"Shoot and K!ll any Demonstrators." County commissioners give orders. - Bana Kenya News, Real African Network Tubanane. Home featured News "Shoot and K!ll any Demonstrators." County commissioners give orders. "Shoot and K!ll any Demonstrators." County commissioners give orders. Vihiga County Commissioner Alex Nkonye has been allegedly threatening to shoot demonstrators if they will disobey his orders. The county commissioner has urged the people to either to go and vote or to stay at home. The County commissioner has given a shoot to kill orders to any demonstrators who will be found the street. The MCAs who the majority are from the opposition criticized the shoot to kill move. 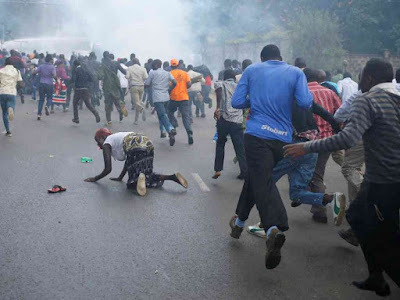 They said the people who will be killed are Kenyans who will also be practicing their constitutional rights. “The county commissioner, as a civil servant, has no right to participate in politics and tell us what we should do and which side we should support,” the assembly's Leader of Majority, Wycliffe Masini, said. Mr. Masini said the leaders had resolved to remain steadfast in the National Super Alliance (NASA) and that no amount of intimidation would dissuade them. “What we have decided is that there will be no elections on Thursday,” he said. The Orders from "above" left the County commissioners to decide whether to practice them. The highest authority has allegedly been issued a warning and shoots to Kill order to the protesters whether peacefully or not.